A Syrian jihadist group linked to Al-Qaeda killed 21 regime and allied forces Sunday near Idlib province, in one of the deadliest breaches of a six-month-old truce deal, a monitor said. "Five jihadists were also killed," Rami Abdel Rahman, the director of the Britain-based monitoring group, said. Ansar al-Tawhid has ties to the larger Hurras al-Deen group, which is also active in the area. Both are considered semi-officials franchises of Al-Qaeda in Syria. The area of Idlib and small parts of the adjacent provinces of Hama and Aleppo are mostly controlled by the rival Hayat Tahrir al-Sham organization. HTS is led by fighters who formerly belonged to Al-Qaeda's ex-affiliate in Syria. 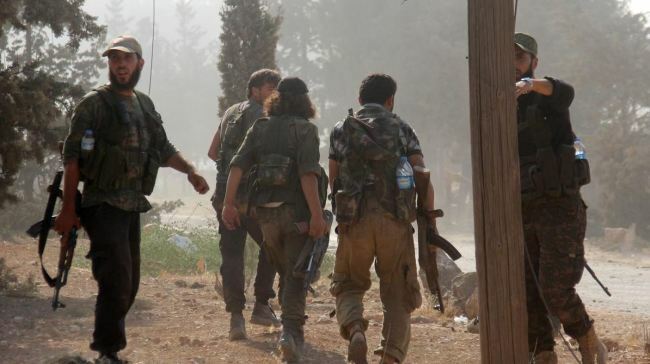 A military source quoted by state news agency SANA confirmed soldiers had been killed and wounded in an attack on their positions near Idlib province. Loyalists forces had killed some assailants, the source added without giving precise figures. Referring to the attack, the foreign ministry said Syria "will not allow terrorists and those who are behind them to carry on with their attacks against innocent civilians and the armed forces". Sunday's deadly assault was carried out against regime positions in the village of Masasna, in the north of Hama province, the Observatory said. "It was one of the highest casualty figures among regime ranks since the Putin-Erdogan deal," the Observatory's Abdel Rahman said. He was referring to an agreement reached in the Russian resort of Sochi between Russian President Vladimir Putin and his Turkish counterpart Recep Tayyip Erdogan. Under the September 17 deal, Turkey was supposed to exert its influence over anti-regime groups in the Idlib region to get them to pull back their fighters and heavy weapons from a demilitarized zone. The agreement was meant to stave off a planned offensive by the regime and its Russian backers that aid groups feared could spark the eight-year-old Syrian conflict's worst humanitarian crisis yet. The government assault on the last major bastion of forces opposed to President Bashar al-Assad's rule has indeed been held off but the deal's provisions have not been implemented and the de facto truce looks shakier than ever. Since the Sochi agreement, HTS has consolidated its grip on the Idlib province and Turkey appears to be in no position to deliver on its commitment.